WEST WINDSOR – Unexplained deaths and determining their cause will be the topic during a lecture at Mercer County Community College, with an expert on forensic investigation relating her experiences dealing with homicides, suicides, and similar occurrences. 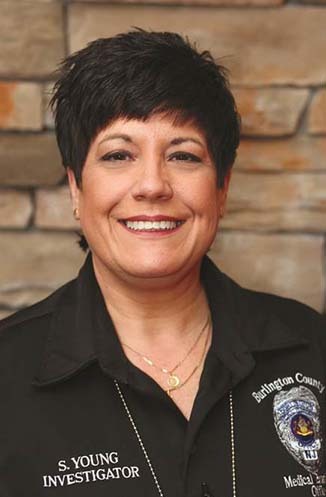 “Medico-Legal Death Investigation” will be the subject of a lecture by Sandra Young, forensic medico-legal investigator with the Burlington County Medical Examiner’s Office, at noon on Tuesday, April 21 in the Communications Building, Room 109. Her talk is part of the college’s Distinguished Lecture Series at the West Windsor Campus, 1200 Old Trenton Road, and is free and open to the public. Young will explain how the medico-legal death investigation system is responsible for conducting investigations and certifying the cause and manner of unnatural and unexplained deaths. This includes deaths by homicide, suicide, unintentional injuries, drug-related deaths, and other deaths that are sudden or unexpected. In addition, she will discuss the role of death investigations in many aspects of public health practice and research, including surveillance, epidemiology and prevention programs, most often in injury prevention and control, but also in prevention of suicide, violence, or substance abuse. Young is a doctoral candidate in Public Administration at Capella University, and has earned a master’s degree in Criminal Justice from Everest University and a Bachelor of Arts in Criminal Justice from Rutgers University. She is an adjunct professor at Burlington County College and Rowan University. Sandra M. Young, medico-legal investigator with the Burlington County Medical Examiner’s Office, will deliver the Distinguished Lecture at Mercer County Community College on April 9.